"When I found out that there was a YA book about cults, of course I had to read it. 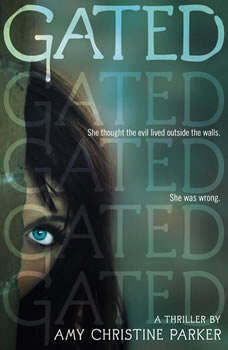 As it turns out, Amy Christine Parker’s Gated is an awesome, creepy book that reminds me of my favorite cult films while still being surprising." "Parker doesn’t pull punches, indicating a level of brutality that will appropriately disturb even as it successfully conveys Lyla’s complete entrapment in the Community. Compelling and not that distant from real-world cults that have ended in tragedy." "Parker skillfully explores the mindset and inner workings of an apocalyptic cult, steadily building toward the inevitable moment of truth...As for the apocalypse itself, Parker keeps things suitably ambiguous, resulting in a complex, intriguing tale rooted in real-world events." "This well-plotted tale will allow readers a glimpse into the possible world of a doomsday cult...The language is accessible, making it a good choice for reluctant readers. After the last page is turned, the question will linger: 'Could I ever be deceived like this?'" "A well-rounded and thorough look into cults while still remaining entertaining throughout. I look forward to reading more of Parker's works in the future."